Stash buster!!! 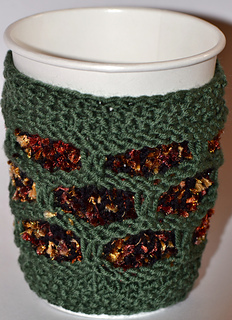 Make a unique cup cozy in a few hours. This pattern offers 4 different designs including Fair Isle, slip stitch, and solid cables. Once you got the idea, you can substitute any stitch pattern or even a letter for color design. You do not like the cup cozy idea? No problem. How about using this pattern for a wrist warmer or a boot topper? Be creative! It is easy with this pattern.